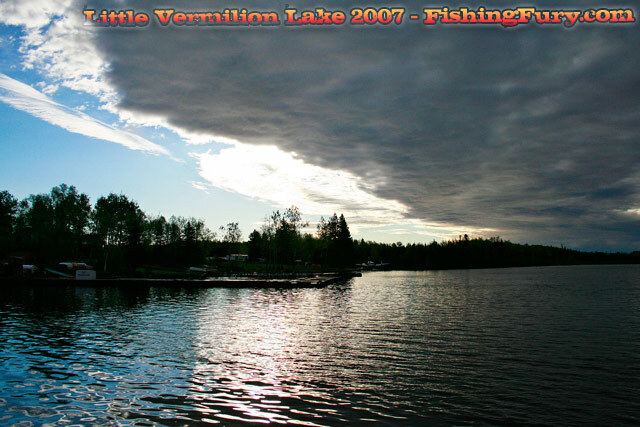 Little Vermilion Lake 2007 | FISHING FURY - A Fishing Blog with Attitude! 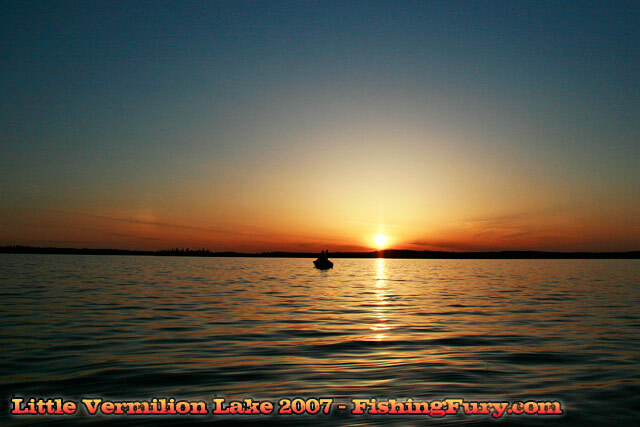 During our last epic voyage to Little Vermilion we stopped at several locations to fish and stretch our legs. The luxury of time was not on our side this trip however, and we decided to drive straight through the night and day, covering all 2000 kilometers in a non-stop 23 hour marathon. 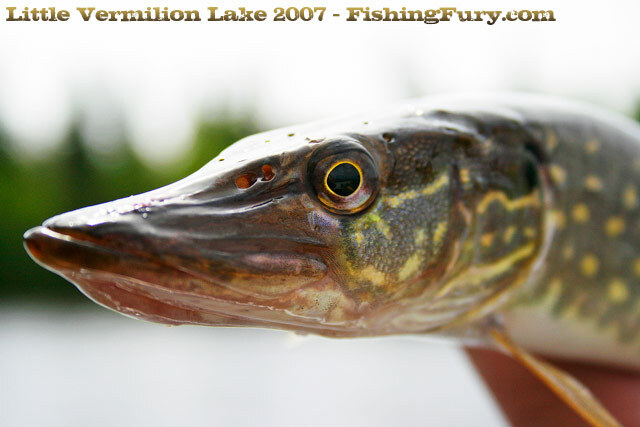 We rolled into Red Lake around seven in the evening and we immediately headed to the docks to target some pike. At the docks we spoke with some locals about the recent fishing conditions and sadly they did not have any encouraging information to share with us. 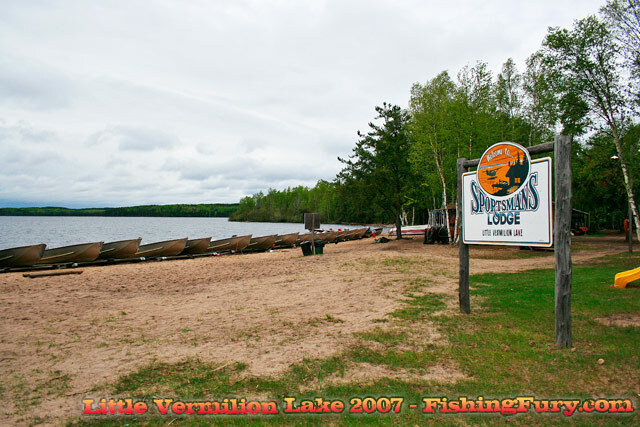 Apparently there was snow that very morning – a huge contrast to the weather we experienced on our last trip to Little Vermilion in 2005. We packed it in after an hour and headed to a nearby bar called “The Bomb” in Balmertown to grab some food and drink. The beer was good, but the food was pretty greasy and it left a lot to be desired as our last meal before the trip. I don’t think we talked much about food on our last trip, mostly because we didn’t bring any, and the same held true this year. In true Fishing Fury spirit, we we’re to become one with the lake over the next week. Aside from a single case of beer, that miraculously turned up empty on the fourth night, everything we would consume would come from the lake and the fish would be cleaned and cooked by the same hands that caught them, and there is no meal more satisfying than that. We left the bar as it was getting dark and headed down the road to the pre-designated meeting area. As the last glimpses of sunlight fell below the tree line we made a few casts off the dock and started catching some good size walleye on spinner baits and jerk baits. 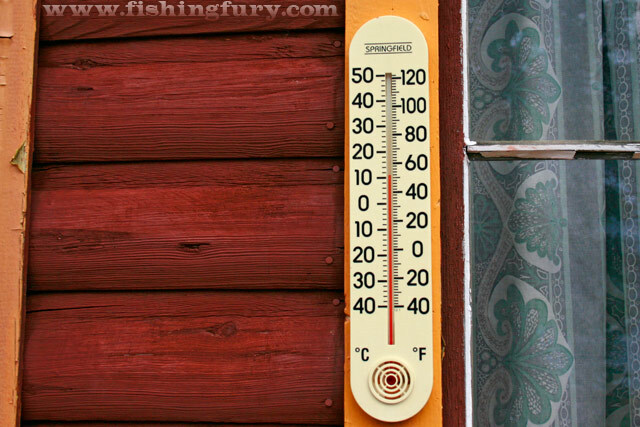 The temperature dropped quickly as darkness fell and we decided to call it an early night so we could wake up early for our plane ride to Little Vermilion Lake. With our seats reclined and sleeping bags zipped up tightly, we discussed our plans for the following day and drifted of to sleep. We woke up around seven in the morning as the other fishermen started to arrive. As the groups started unpacking their gear from their trucks others were already getting on the airplane and on their way to Little Vermilion. Unfortunately for one of the gentleman, whom I believe I was talking to just before he jumped in the airplane, he had some how displaced his hip while getting in. He was in a great deal of pain and now perched in the tiny flight seat of this small aircraft. An ambulance had to be called in and it took nearly 8 of us to help him out of his seat and on to a strecher, it only took about 5-10 minutes but it must have felt like years in all that pain. 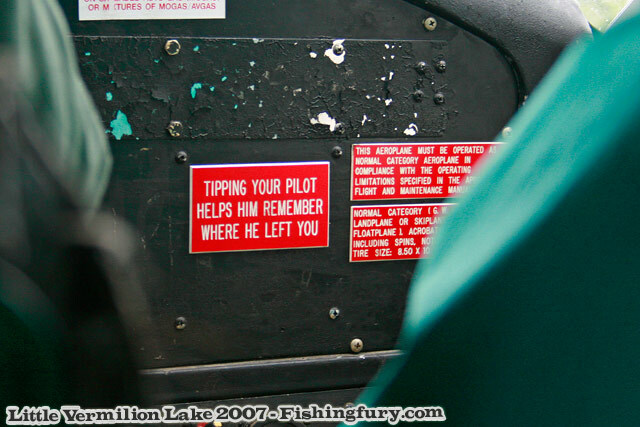 That said, he left in the ambulance greatful to everyone that helped, but what impressed me the most was that a few days later he had finally made it to the lodge and was able to fish and have a good time. If I had any extra Fishing Fury shirts, that guy would have deserved one for sure. 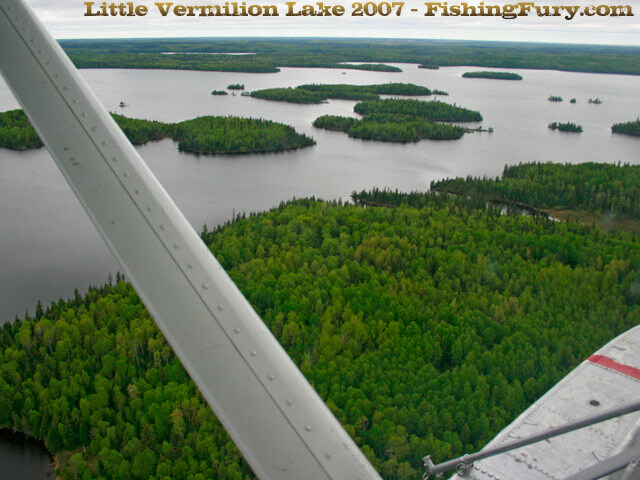 After the short delay, each group took their turn climbing into a small airplane packed with their gear, and after several trips back and fourth we found ourselves touching down gently onto Little Vermilion Lake. We were greeted by Brett Geary, the owner of Sportsman’s Lodge, and just after that we ran into our good friend Connie Inman who had been instrumental in helping us organize our trip. We sat down with Connie to catch up on things since the last time we’d seen each other, not to mention to share photos of monster pike, he also informed us of the unseasonably cold weather – the worst he had seen since 1984. That just goes to show you how long Connie has been coming to Little Vermilion Lake, and just how well he knows it, but to put it into perspective he hasn’t just been coming here for the last 30 or so years, he’s been doing it almost 3 times a year. We threw on a few extra layers of clothes and headed out on the water under a cloudy grey sky. Heading straight toward our favorite spots we searched for that first pike over 40″, but all we found were small pike under 30 inches and it wasn’t until later in the day that we caught our first fish over thirty inches. A sub par result compared to our previous visit to the lake where we boated several fish over over thirty two inches in our first day. The wind was cold and our were hands numb, we stopped a few times to admire and film the bald eagles that populate the surrounding area of the lake, but most of all we continued fishing in search of giants. Since Clive has started making his own in-line spinner baits we thought it would be a good opportunity for a bit of side competition, so for this trip Jon would stick mostly to the big Mepps spinners (#5 Black Fury/Aglia, #7 Magnum) and Clive would use mostly his own custom made ones. The goal, of course, to catch the most fish over 40″. Day two started with plenty of sunshine, exactly what we needed to warm up after that first cold day on the water. 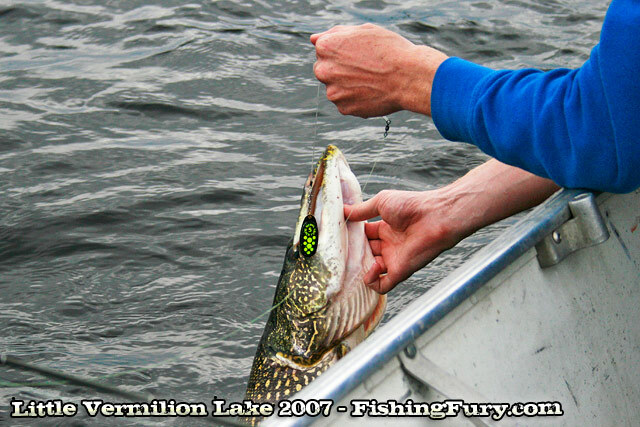 We decided to head toward the south end of the lake this time and fish river mouths, hoping to find pike feeding on walleye. 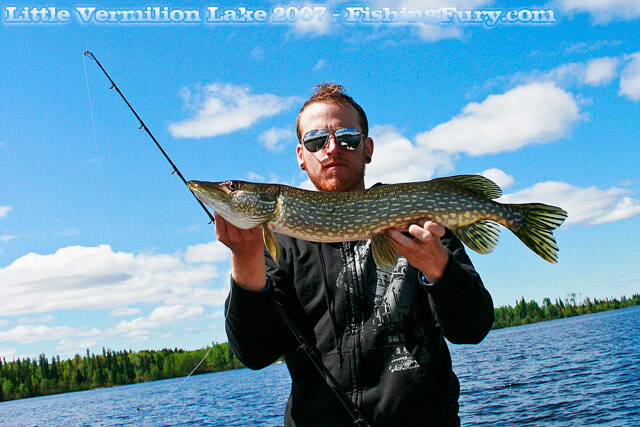 The day started of great, with several pike caught on spinner baits. The average size was still small, but at least we were catching more fish then the previous day. We fished non-stop the entire day, and not only were we the first fishermen on the water, we were the last ones off. Bigger fish were spotted, but they got the better of team fury. 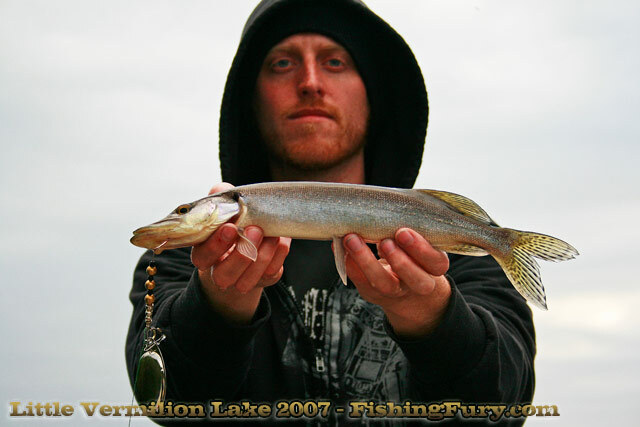 Jon hooked in to two good size pike on a Musky Innovations Reaper Leech in a shallow weed bed, one wrapped it self around the boat breaking his line, and the other spit the hook at the side of the boat. Day three was wet. It started wet and it ended wet. 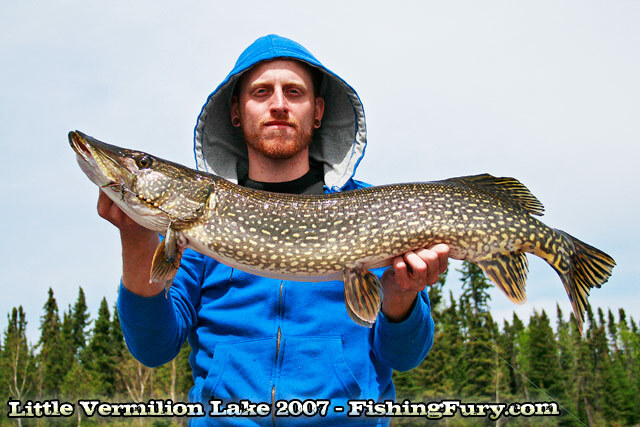 Luckily it was fairly warm, and the trophy pike Little Vermilion is famous for finally decided to co-operate. 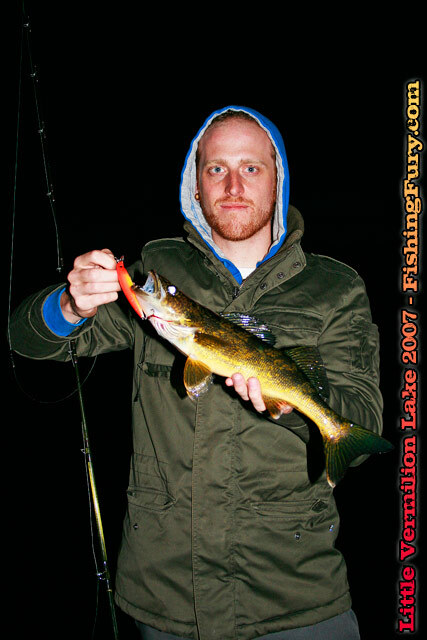 Within ten minutes of getting our lines wet, Jon hooked into a beauty while trolling a Mepps Magnum in-line spinner. After a long battle, we slipped a net under Jon’s trophy, we don’t normally use a net but given the two fish lost yesterday that could have easily been snatched up by a net it was a good idea to at least have one. Jon set the bar for the rest of the trip with the biggest he has ever caught and our first fish well over forty inches. We continued fishing for most of the day, with no fish in the same realm as Jon’s and had to head back to the lodge after some severe thunder and lightning.